Homegrown by Heroes goes national: Kentucky brand will help vets across the U.S.
LOUISVILLE, Ky. — A Kentucky initiative to identify farm products produced by veterans will become a national brand, Kentucky Agriculture Commissioner James Comer announced on Veterans Day at the Frazier History Museum in Louisville. The Farmer Veteran Coalition will administer the Homegrown by Heroes program on the national level. At Monday’s announcement, the Farm Credit System announced a $250,000 commitment to fund the national program. U.S. Sen. Mitch McConnell, U.S. Reps John Yarmuth and Andy Barr, and Louisville Mayor Greg Fischer all spoke in support of the program. The Farmer Veteran Coalition, based in Davis, Calif., helps veterans develop careers in agriculture through collaborations of the agricultural and military communities. Farm Credit’s contribution to the Farmer Veteran Coalition’s Homegrown by Heroes program was made possible by the generous support of Agribank of St. Paul, Minn.; AgFirst of Columbia, S.C.; CoBank of Denver, Colo.; and Farm Credit Bank of Texas, based in Austin. 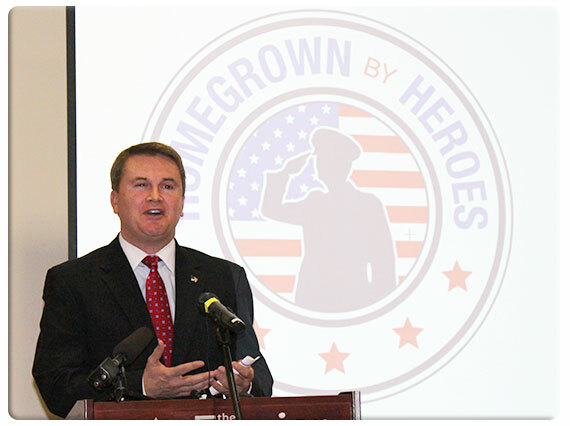 Commissioner Comer launched Homegrown by Heroes in January as a brand that identifies agricultural products produced by Kentucky military veterans, providing an incentive for consumers to buy those products and for retailers to stock them on their store shelves.